The Sawdust City Brewing Co.: A New Year! It's been a while folks, but we've been pretty busy here in Sawdust City. Sorry for the prolonged absence and gaps between posts, but so it goes. It was a great Holiday season and we're excited to start in on the New Year. As our tag line says, "The Dust Will Fly in 2012!" and here we are, 2012 already. The dust has already to started to fly....well moderately at least. Here's a recap on said moderate flying dust! 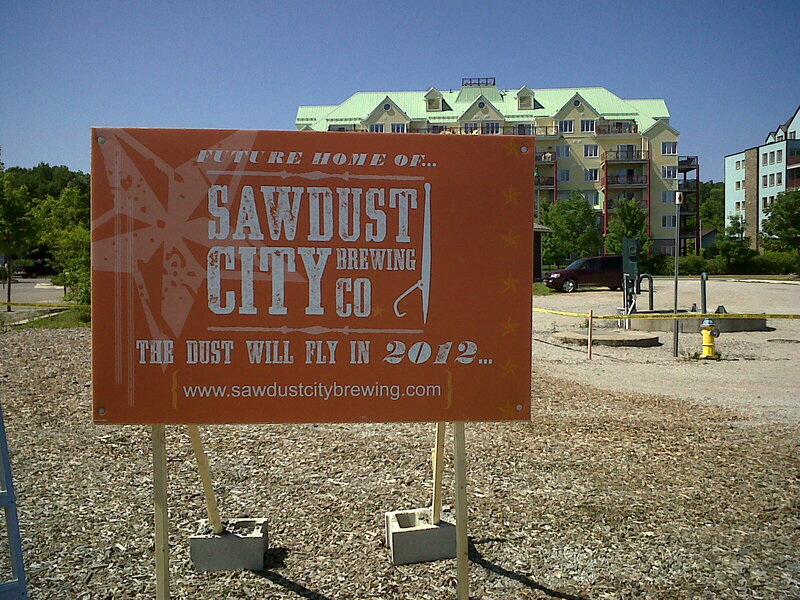 2011 saw Sawdust City kick off with our collaboration brew Great Weiss North. Brewed with the Niagara Teaching Brewery and featured at the CNE, Great Weiss North featured an ingredient from every province and territory in the country. Not a bad way to start if you ask me. Later we brewed a few one-off beers for some events across the province which were again received well, like our "I Swear Sugarpants it was Your Idea". A lactose brown ale brewed with masala spices was a fun little brew that we put together for VoloCaskDays. Intended to be only an experimental one off, I ended up really liking the results though and you just may see this one again in the future! After those one-offs, we finally received our Manufacturer's License from the AGCO on October 31st...this was a big day for Sawdust City, we could finally sell our beer! Starting on November 18th with the release of our Golden Beach Pale Wheat (which saw two simultaneous parties. One at The Griffin Gastropub in Muskoka and one at The Only Cafe in Toronto) we've been selling beer at some of the provinces best beer bars non-stop. We followed up the Golden Beach release party with a party for our Ol'Woody Alt (at The Monk's Kettle in Etobicoke) and hot on it's heals our Lone Pine IPA got the same treatment (at The Burger Bar in Toronto). All three events were attended very well and we'd very much like to thank all those that made the trip out to try our beers. We'd also like to say a very big thank you to the bar owners that hosted our events. Again, we really appreciate all the support you've given us. If it weren't for you guys, we'd have to where to sell our beer, so thanks again! And I know it's only been just under two months, but the reception has been great and we're very excited about the future. 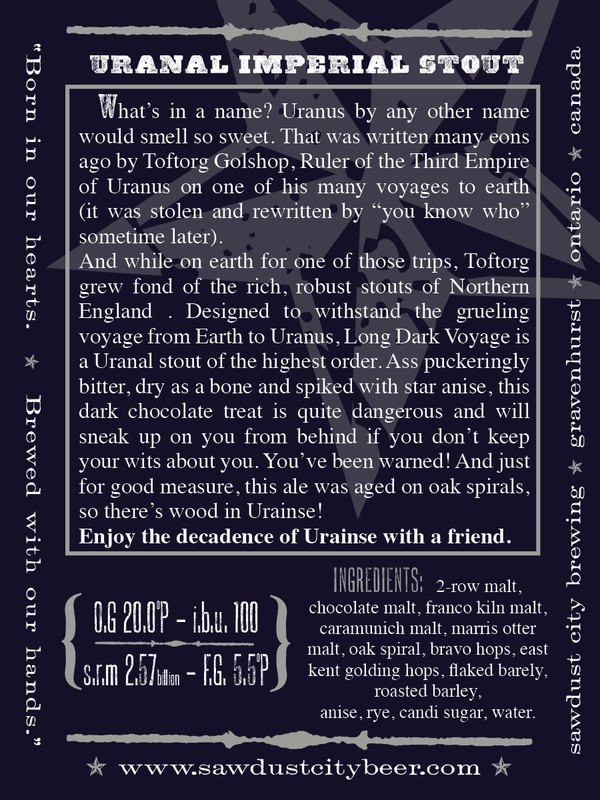 This was a recipe I put together for the Iron Brewer last year but I liked it so much that I decided to brew it again. I made a few changes, mainly taking out the star anise and oak spirals, deciding instead to focus on the intense chocolate and coffee flavours. Like I said, this should be ready in about a month so keep an eye out for it at better beer bars across Toronto. I've already got a few orders for casks of it, the remainder will be bottled with only a few kegs being made. After Long, Dark Voyage, we are going to be brewing our regular stout, "Skinny Dipping Stout" which should be ready to go by early to mid-February depending on the brew schedule at the college. 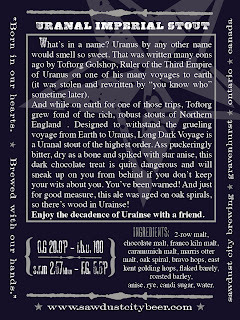 An oatmeal stout with tons of chocolate malt (I also err on the side of chocolate...a good moto to live by if there ever was one), this ale is perfect for the cold winter months. As soon as we brew it, I'll let y'all know so you can get appropriately excited. After we did our first round of test batches at the school, this was my favourite of the four I brewed. It's hard to pick favourites, I mean, I loved them all in there own way. But this one just stood out. As we move into the spring we'll be finishing off the last of our mainstay brands with Gateway Kolsch, which should be brewed and packaged by March. A traditional German style Kolsch, this ale will be brewed using only German malt and hops. That will be followed by our second seasonal, which will remain a surprise until we release it. Ohhh, a teaser! Thanks again for all the support in 2011, we really do appreciate all the kind words and more importantly, we thank you for drinking (and selling) our beer.